This unique square pie is made with cheddar pastry. The fresh apple and cranberry filling is cinnamon-spiced and topped with a pretty pastry lattice. Mix 1-1/2 cups flour and baking powder in large bowl; cut in 1/4 cup butter until mixture resembles coarse crumbs. Beat egg and milk in small bowl with whisk until blended. Add to flour mixture; stir just until moistened. Stir in cheese. Form dough into ball. Place 2/3 of the dough on lightly floured surface; roll out to 15-inch square. Place on bottom and up sides of 8-inch square baking dish. Turn under edge. Mix sugar, 1/3 cup flour and cinnamon in large bowl. Add apples and cranberries; toss lightly. Spoon into pastry shell; dot with 1 Tbsp. butter. Roll out remaining dough to 12-inch square; cut into 1/2-inch-wide strips. Place strips over filling to form lattice; seal and flute edge. Bake 35 to 40 min. or until golden brown. Cool on wire rack. Place 6 of the strips over filling. 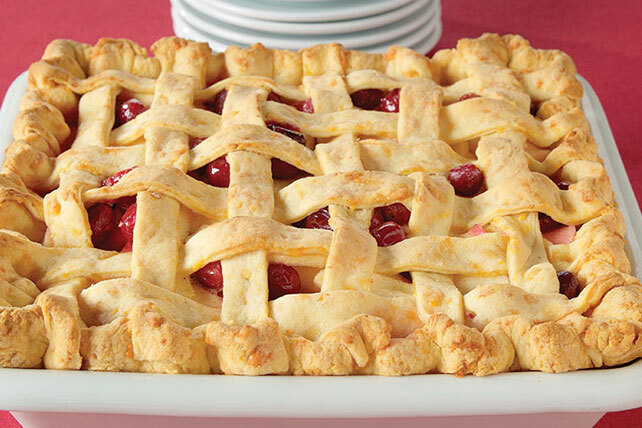 Weave lattice crust with remaining strips by folding back alternate strips as each cross strip is added. Fold trimmed edge of lower crust over ends of strips. Seal and flute edge. Bake as directed.